The third issue of Into the Ruins is now available for order! 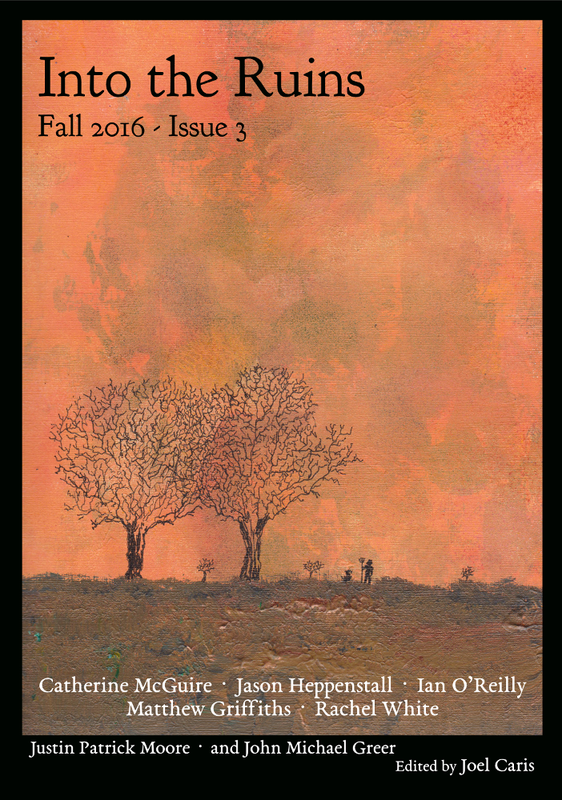 This Fall 2016 issue comes as a 7″ x 10″ book packed with 108 pages of stories of our deindustrial future, editorials, letters to the editor, book reviews, and a few miscellaneous ramblings and surprises. A high quality, PDF, downloadable digital edition is now also available. You’ll find within a fantastic new story from Jason Heppenstall in which a mysterious old man cultivates a garden on the dusty outskirts of a desert town, Catherine McGuire exploring one woman’s fight against cruelty and exploitation, a tale from Matthew Griffiths set in the world of John Michael Greer’s Star’s Reach, a meditative snapshot of our post-oil future from Ian O’Reilly, and a lovely new tale from Rachel White that captures the mythic dimensions of our future. Not to mention, a new “Deindustrial Futures Past” column from John Michael Greer, Justin Patrick Moore’s survey of characters from James Howard Kunstler’s World Made By Hand series, and a thought-provoking, rollicking, filled-to-the-brim letters section.